An open letter to the Archbishop of Canterbury, Justin Welby. I wonder how you reconcile this with the fact that one of your churches, St James’s Piccadilly, chose Christmas to turn itself into a church of hate? As I am sure you know only too well, this church spent eight months preparing its Christmas stunt, the erection of an 8 metre-tall, 30 metre-long replica of the Israeli ‘wall’ that it claims surrounds Bethlehem and imposes ‘desperate hardship’ on the town’s inhabitants. Although the church acknowledges in passing that the original purpose of this ‘wall’ was ‘to protect Israeli citizens from terrorism’, it suggests instead that its only result has been to oppress and harass innocent Palestinians. The inevitable effect of this wholly mendacious and malevolent travesty will be to incite hatred against Israel and all who support its defence against the war of extermination being perpetrated against it. ‘… opposes all forms of racism including antisemitism and supports the right of the State of Israel to exist with secure internationally recognised borders’. I’m afraid this really is the most nauseating cant. If this church were really concerned to stop antisemitism and allow Israel to live in peace with its neighbours, it would have acknowledged that Palestinian children are being routinely taught to hate and murder Israelis (see this or this for example). If this church really supported Israel’s right to exist within secure borders, it would have acknowledged the refusal by Mahmoud Abbas (leave aside Hamas) ever to acknowledge Israel as a Jewish state; or the repeated Palestinian attempts to attack and murder Israelis, too many of which have been all too successful. · The ‘wall’ does not surround Bethlehem. · For most of its length it is not a wall at all but a simple chain link fence. · It has been constructed not to oppress Palestinians but solely to prevent Israelis from being murdered by Arabs. · This security barrier has had to be built as a wall alongside one area of Bethlehem because a fence here – cheek by jowl with Jerusalem ­– would be insufficient to prevent the very real threat of some of its inhabitants murdering large numbers of Israelis. · The undoubted hardships caused by this barrier are solely the result of the ever-continuing attempts by some of those living behind it to murder yet more Israelis. · Since this security barrier was constructed, the number of Israelis murdered in terrorist attacks has decreased by some 70 per cent – while the number of attempted attacks remains high. ‘unconditional love received, love overflowing into a frequently love-lost world’? There are other glaring omissions and distortions. The church makes no mention of the fact that, as shown here, Rachel’s Tomb, one of Judaism’s holiest sites which is very near Bethlehem and where many attacks have taken place against Jewish worshippers, really has been walled off and turned into a kind of fortress – to protect Jews from further attacks by Arabs. It unaccountably makes no mention of the fact that, while the Christians of the Middle East are – as you said in your sermon and as Michael Curtis details here – being persecuted and murdered, the only country in the region where Christians are thriving and increasing, in a society that allows them total freedom of worship, is Israel. St James’s makes no mention of any of this. Instead, from tomorrow it will host a hate-fest of anti-Israel activists and personalities, whose contribution to the store of love and truth in the world is described by Richard Millett here. Joel Leyden: Are You Traveling to Israel? Do you shake hands or hug? A paradigmatic characteristic of all bigotry is to take a fault that is widespread among all cultures, races, religions and nationalities and to attribute it singularly to one group. The truth, of course, is that all groups have some among them with these negative characteristics. The bigots who make these claims correctly point to the fact that some members of these groups display the negative characteristics attributed to the groups as a whole. But the bigotry consists of singling out any such group for unique condemnation on the basis of these widespread faults without acknowledging that members of other groups have them as well, sometimes in greater proportion than the group that is singled out. This is precisely what is occurring in the context of the nation state of the Jewish people, Israel, being singled out for boycotts, divestment and sanctions. As the president of the American Studies Association, Curtis Marez, acknowledged, after his organization singled out Israel for an academic boycott: Many other countries, including all of Israel’s neighbors, have far worse records when it comes to human rights and academic freedom. Moreover, other countries (including China, Russia and Turkey) have had longer and far more oppressive occupations than Israel without offering (as Israel has) to end the occupation as part of a negotiated peace. But Prof.
His association is not simply starting with Israel, it is stopping with Israel. A vote to boycott Chinese, Cuban, Russian or Palestinian academic institutions— which are worse by every measure of civil liberties, human rights and academic freedom than Israeli institutions – would garner few, if any, votes. This too is the paradigm of bigotry: starting and ending with one ethnic or religious group and applying a different standard to every other group. Here not only does the shoe fit, but like Cinderella’s slipper, the bigoted shoe in this case fits only one group: academic institutions in the nation state of the Jewish people. There are those who claim that the BDS movement against Israel cannot be anti-Semitic, because it is directed at a country and not at individuals. But by treating Israel as the Jew among nations – singling it out for condemnation when others are far worse by any relevant standard – the advocates of BDS are simply expanding the notion of anti-Semitism beyond the individual to the nation state of the Jewish people. When Nazis condemned “Jewish physics,” “Jewish art” and “Jewish business practices,” they too claimed that they were focusing on Jewish institutions rather than Jewish individuals. That defense won’t work. Treating the Jew among nations precisely the way classic anti-Semites have treated the Jewish people is simply a new adaptation of the oldest of prejudices. So let the world condemn those who single out the nation state of the Jewish people for the application of a double standard. Let the world understand that bigotry is bigotry whether directed against the Jew among nations or the Jew within nations. The writer, ALAN M. DERSHOWITZ, is a veteran professor at Harvard Law School, is a prominent advocate for Israel in the United States. David Brotsky aka David Appletree aka JIDF calls Israeli border policemen "fake" cops, but the admin of the JIDF has never served one day in an Israeli uniform. David Brotsky attacks those who serve in the IDF, calling us "rapists". He scams the Jewish community, collects money for the JIDF, but it is not a non-profit organization. Brotsky aka Appletree ignores the IRS. 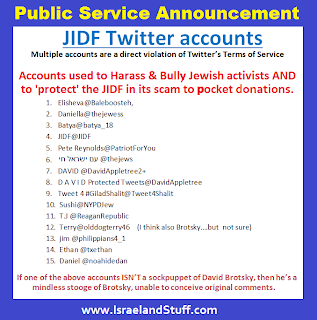 David Brotsky makes a bad name for anyone who calls themselves a Jew or Israeli. 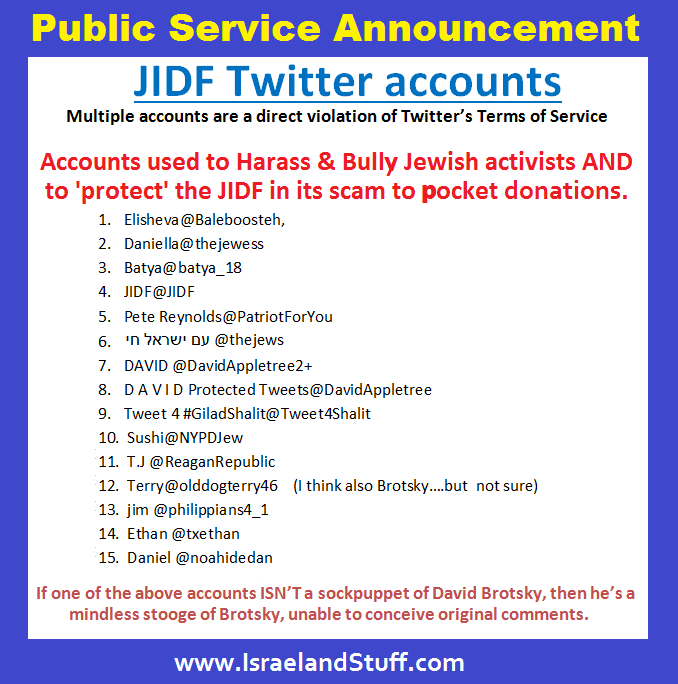 Please sign and end the JIDF aka Brotsky campaign of cyber bullying! Tourism Ministry estimates that 2013 will close with slight increase on visitor entries from the record year of 2012. This, despite the fact that incoming tourism had to deal with issues related to the security situation and the government budget. As a result of the marketing efforts and the development of new markets alongside maintaining existing markets, the annual contribution of tens of billions of shekels made by tourism to the economy has been maintained. According to the Central Bureau of Statistics, 306,000 visitors entered Israel in November 2013, 10% more than November 2012 (Operation Pillar of Defense), and slightly less than the months of November 2010 and 2011. Of these visitor entries, 256,000 were tourists (staying more than one night), 15% more than November 2012, and 3% and 5% more than November 2010 and 2011 - an all-time record for the month. November also saw a reduction of 41% in the number of day visitors from Sinai into Israel from last year (because of the instability in Egypt), a continuation of the improvement from August -October 2013. There was however an improvement in the number of day visitors as compared to August-September 2013, with a 90% decrease. October 2013 did not include the Jewish holidays, so an increase in incoming tourism would be expected. 220,000 entries were by air, 19% more than November 2012, of which 8,000 arrived on direct flights to Eilat (6% less than November 2012) . 36,000 came through the border crossings, 7% less than November 2012; 27,000 came through the border with Jordan (1% increase) and about 9,200 through Taba to Eilat (23% less than last November). 49,000 entries were recorded by day visitors, 9% less than November 2012. Of these, 32,000 arrived on cruise ships (40% more than last November). 15,000 day visitors arrived via the land crossings (48% decrease on November 2012) and about 2,000 by air (10% more than last November). Since the beginning of 2013 through November, about 3.3 million tourists and day visitors arrived in Israel, almost identical to the same period in 2012, 6% more than 2011 and 3% more than 2010. Of these entries, 2.7 million were tourists, a slight increase on the same period in 2012, 4% more than 2011 and 5% more than 2010. 2.4 million entries were recorded by air, 3% more than the same period in 2012. About 547,000 entries were day visitors, 7% less than the same period last year. Of these entries, about 245,000 came on cruise ships, 7% more than in 2012. 179,000 came via the border crossings (35% less than 2012) and 123,000 by air (41% increase). "Tourists continue to arrive in Israel from all over the world in growing numbers and see Israel as a safe and attractive tourist destination. The tourists choose to stay in a variety of different accommodation options, allowing the income generated to be dispersed across all sections of the population; small and large businesses, in the cities and in the periphery, can make a decent living from incoming tourism - and so it should be. The Tourism Ministry welcomes the increase in tourism and will continue to work tirelessly to increase incoming tourism, including next year."